Rub, Dredge, Fry (repeat) | Pones Inc. This piece examines our deep fried opinions, traditions, and relationships with comfort food. 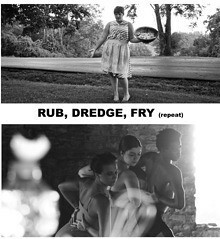 Layering dance, theatre, music, and cooking audiences are asked: Why fried? What happens when cost, accessibility, convenience, and tradition all factor into our choices? Are you better than fried food?